Disney Channel’s Original Movie, Freaky Friday, premieres Friday, August 10 at 8p. 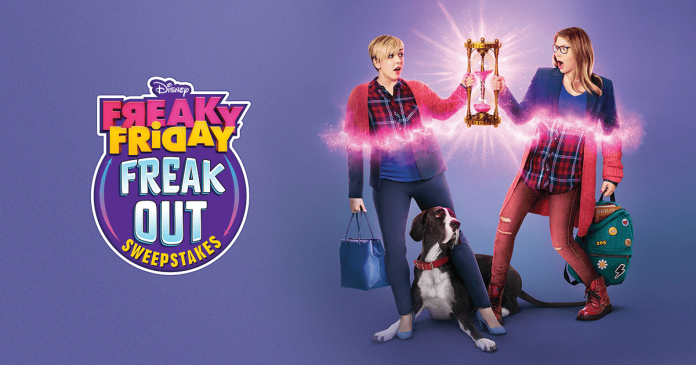 To celebrate, visit www.freakyfridayfreakout.com and enter the Disney Channel Freaky Friday Freak Out Sweepstakes for a chance to experience the life of a Disney Channel Star. One lucky winner will receive a 4-day/3-night trip for a family of four to Los Angeles, CA for a tour of the Disney Studios lot. Ends: 11:59 pm, August 10, 2018. Eligibility: To be eligible for the Disney Channel Freaky Friday Freak Out Sweepstakes, at the time of entering you must be between the ages of six (6) and fourteen (14), inclusive, or the Parent or grandparent of an eligible Child and be a legal resident of, and physically residing in one of the fifty (50) United States or the District of Columbia. Details: Win a Flight for Winner and (3) guests, Hotel Room for 3 nights, Hair & Make-up; Wardrobe & photo session, Disney Channel Set Visit, Walt Disney Studio Lot Tour, Radio Disney Studio Visit, and Four (4) 1-Day Disneyland Resort Park Hopper Tickets. For complete details and official rules, visit www.freakyfridayfreakout.com.